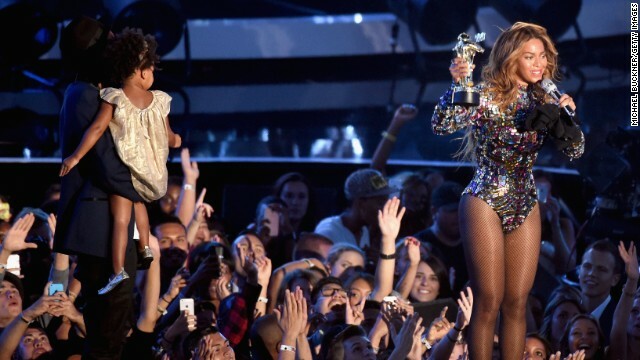 Beyonce was joined onstage by her husband, Jay Z, and their daughter, Blue Ivy, at the MTV Video Music Awards. Michael Brown will be laid to rest today. It was the year of the rear at the VMAs. And militants free an American journalist after two years. Killer almost ID'd: As the hunt for the James Foley's killer continues, Britain says it's close to identifying the man who beheaded the American journalist on video. In the horrifying video, Foley, 40, kneels next to a man dressed in black, who speaks with a distinctly English accent. The tiniest details in the videotape could provide the key clue to the killing in Syria. Peace pleas: Michael Brown will be laid to rest today, and his father says he just wants one thing: peace. "Please. It's all I ask," Michael Brown Sr. said yesterday. His son, 18, was fatally shot on August 9 by a police officer while walking down a street in Ferguson, Missouri. His death sparked days of violent protests in the St. Louis suburb. United in pride: A team in Seoul, South Korea, broke the hearts of Chicago's Jackie Robinson West to win this year's Little League World Series. But the Windy City and its sports teams have rallied behind the young superstars. "We're the best team in the nation and the second best team in the world - you can't have anything better than that," Chicago pitcher Marquis Jackson told ESPN. Mayor Rahm Emanuel applauded the team's positive attitude. Free after two years: An American journalist held in Syria by Islamist rebels was released yesterday. Peter Theo Curtis, 45, is believed to have been captured in October 2012 and held by the al-Nusra Front, a Syrian rebel group with ties to al Qaeda. Year of the rear: Nicki Minaj paid tribute to her assets with song and dance at the 2014 MTV Video Music Awards. But last year's chief twerker took the high road. Miley Cyrus stood offstage and watched as a young homeless man accepted her best music video award. And where celebrities gather, drama follows. Gunshots inside a party hosted by Chris Brown wounded three people, including rap mogul Marion "Suge" Knight. Dancing elephants: What's not to love? The two giants dance to violin music, until they decide enough is enough. Like a boss: This hamster has such an awesome miniature pad, we want to shrink ourselves, move in and become roomies. Awesome pregnancy vine: Watch and learn, my friends. Eeeew! What happens when flies land on your food? This is not for the faint of heart. THANKS CNN TEAM!!!!!!!! AFTER FOUR DAYS OF MY COMMENTS STILL AWAITING MODERATION , I'VE HAD SUCCESS THIS NEW DAY MONDAY AUGUST 25, 2014!!!!!!!! IT'S GOOD TO BE BACK!!!!!!!! RIP Michael Brown. My condolences to his parents and family members. How nice that the MTV music stars paid tribute to Mike Brown. Was there anyone there to stand up for the store owner Brown pushed around and stole from?